Fried chicken is southern food at its best. It has deep and meaningful roots in our nation's history, and it has inspired food lovers emigrating to Georgia to create their own versions of it. Chef Asha Gomez of Cardamon Hill restaurant, recently expanded its lunch menu to include new renditions of her amazing and delirious Kerala fried chicken. This Indian inspired fried chicken is marinated overnight, seasoned with a plethora of provocative Indian spices and fried in hot coconut oil. The result is a perfectly moist, and tender boneless chicken thighs that have been fried until they reach a delicate crunch. One bite, is all that it takes for you to realize this is no ordinary chicken. Once the flavors hit the roof of your palate your brain goes crazy trying to figure out the flavors that make your mouth tingle with so much happiness. Cardamon Hill fried chicken is provocative but unpretentious, and is one of those things you need to try if you ever visit this restaurant. 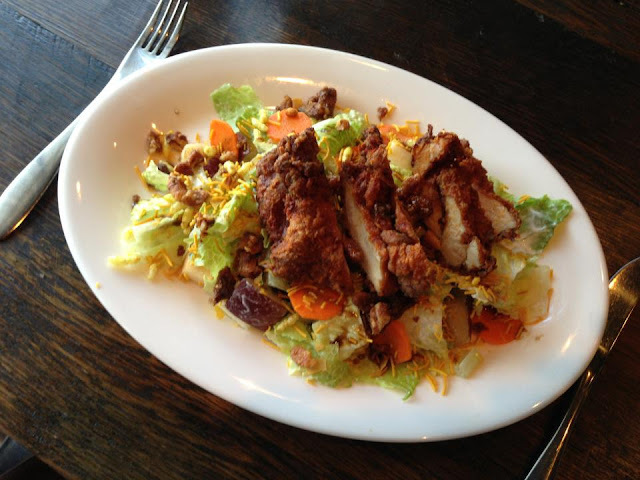 You can order it with low country waffles and spiced maple syrup or in a salad that comes with romaine lettuce, roasted pineapple, diced apple, spiced pecans, carrots, and grapes tossed in a buttermilk dressing topped with puffed rice and fried lentils. Cardamon Hill's Kerala fried chicken has become a signature dish at the restaurant and for the past two years have won the people choice awards at Atlanta's Mother Clucker Fried Chicken Festival. 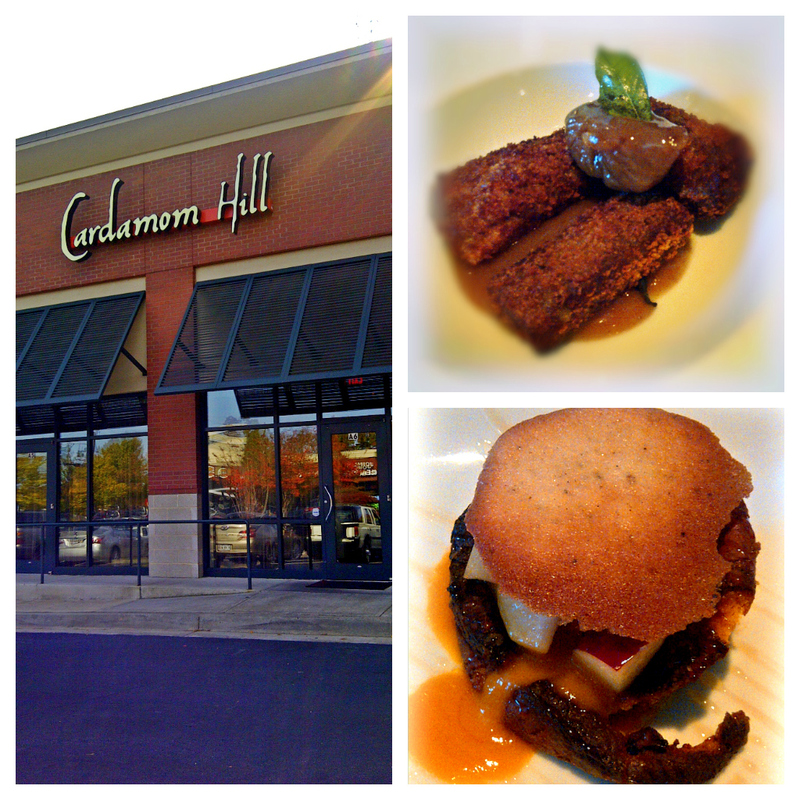 Cardamom Hill is located in Berkeley Heights an Atlanta neighborhood between upscale Buckhead and the burgeoning Westside. 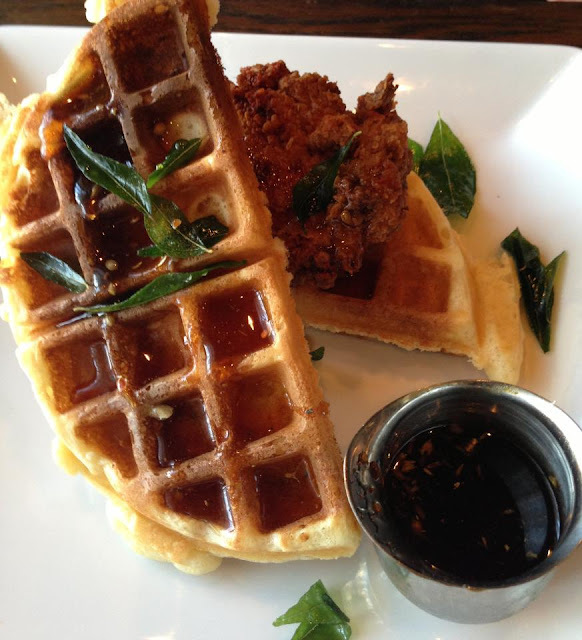 It was named one of the best 50 new restaurants to open in America in 2012 by Bon Appetit Magazine and recently received a Silver Spoon Award for being one of the top 10 dinning destinations in Georgia. Cardamon Hill is perfect for kids that are culinary explorers. My 12 y/o daughter ordered the duck and plantain croquettes and the mango bread pudding for dessert and really like it. Cardamom Hill is open for lunch Monday through Friday and through Saturday for dinner, closed Sunday.